The Pewter Wolf: Courting Darkness Cover Reveal! COVER REVEAL! COVER REVEAL! MYSELF AND KATE FROM READING THROUGH INFINITY HAVE A COVER REVEAL FOR YOU ALL!!! ... can you tell am a little excited to reveal this? Anyway, Kate and I revealed this cover on our Twitters about an hour or so ago (Kate is at @Katelovescolour and I'm at @PewterWolf), but we both said we wanted to blog about this cover. And if you guys haven't guess, I did mention this last week on my His Fair Assassin Mood Board Week. Yes, it's Courting Darkness. And I am quite excited to be involved in the tour as I plan to read the series this year as part of my Year of Blood and Magic and, if you have read this series, there is a lot of blood and murder and assassin nuns! HISTORICAL ASSASSIN NUNS!!! 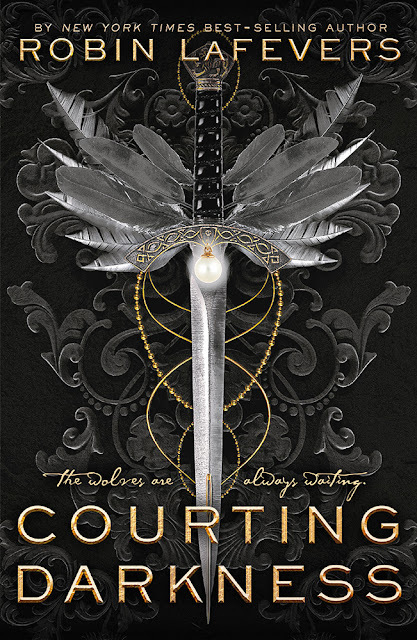 So I am thrilled and excited to reveal the cover for Courting Darkness and revealing a tad of information about the book! TA-DAH!!! Doesn't it look pretty and messed-up?! I love the little detail of the sewing needle at the tip of the sword - a subtle hint that the needle is mightier than the sword? What do you guys think? You like? This is a little outside my comport zone but am excited to sink my teeth into this soon! Before I end this post, I want to thank Layla at Andersen asking myself and Kate if we wanted to do the cover reveal and for Kate for being awesome. You guys rock!! !